Sometimes things need to be done in a certain way and not everyone approves. There was no vote. 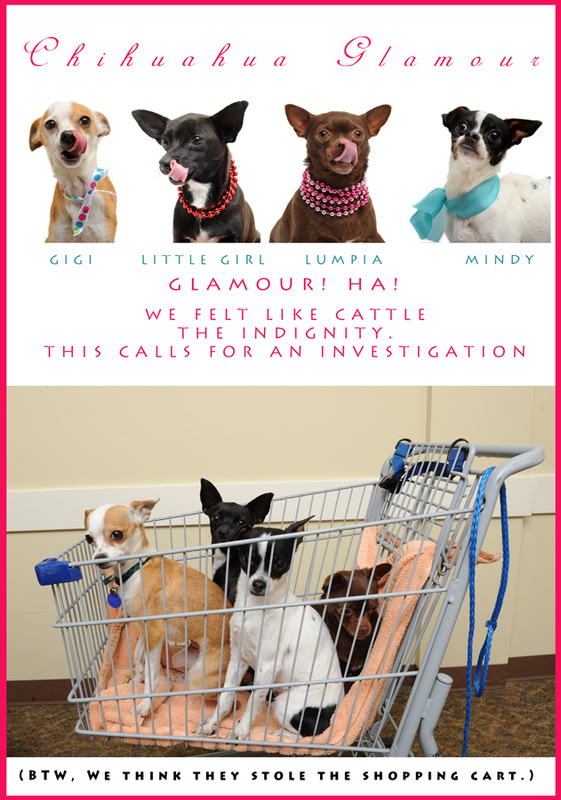 When the chihuahua’s heard they were going to a photo shoot, they started making demands. They asked for a limo but got a mini-shopping cart. They wanted pearls. They got Mardi Gras beads and ribbons. Gigi and Little Girl wanted steak and got peanut butter. Mindy wanted a pedicure, but there was no time. Lumpia wanted to go to Beverly Hills, but that was out of the question. (We began to suspect that there has been to much TV in their previous lives.) Ultimately when the din of their high-pitched barks died down, we could tell they were happy to get out of their kennel for a wee bit and be held. More dog photos may be seen @ http://www.annechadwickwilliams.com.